Regular readers will know that I'm a huge fan of Twinkl resources, especially when it comes to themed resources for different special occasions throughout the year. This week we've been making some simple Easter bunting using a free printable resource - Easter Card Templates (free download). This resource contains a variety of different Easter and Spring themed pictures to colour, which can be used in all sorts of Easter crafting. To make our bunting, once Mia had coloured in the pictures I cut them out and glued them to circles of pastel coloured cardboard. I punched a hole in the top of each one and strung them together with some purple yarn. I used a small piece of tape to make sure that all the pictures were facing the right way, and hung them up above our fireplace for a cheery, colourful decoration. Mia loves colouring and the bunting was so easy to make! It would be a great activity for a classroom or group of children, and you could also use the colouring pictures to make Easter cards, collage pictures, or other types of decoration. 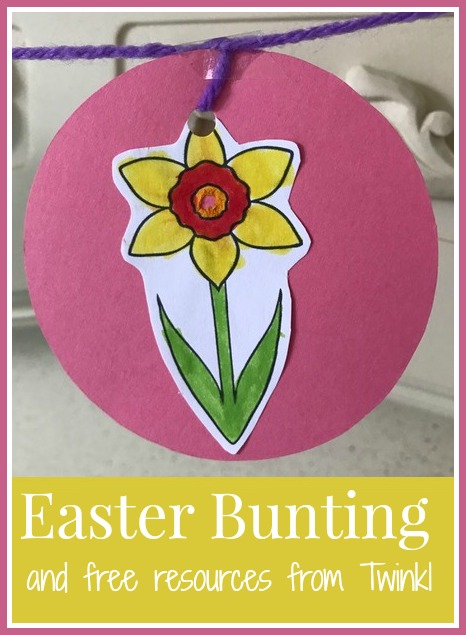 Twinkl have many many more resources for Easter which are fantastic either as standalone crafts and activities or basic worksheets that can be used for your own crafting. Some are available to subscribers only but the Twinkl website also has a large selection of printables which are free to download, you just need to register. Below are a couple more fantastic Easter resources which would be great for keeping the children entertained in the run up to Easter. Easter Colouring Posters (free download) - large colouring sheets great for very little ones that could be mounted on coloured card and used as decorations, or printed at a smaller size to be coloured and used for Easter cards. Easter Egg Page Borders (free download) - brightly coloured Easter Eggs decorate the borders of these pages which are great as a frame for your child's drawing or writing. You can see the full range of resources on the Twinkl website. I am a huge fan of Twinkl, and have been given a Twinkl Platinum Plus membership in exchange for sharing information about Twinkl resources on my blog.